TECHNICAL SPECIFICATION DOCUMENT HYDRAULIC POWER UNIT DESCRIPTION: The hydraulic power unit provides the fluid power necessary to articulate the stabilizer fins. Quantum power units can be paired with a variety of stabilizer hull unit sizes and quantities based on vessel requirements providing a multitude of arrangement options. Designed to consolidate maximum machinery output into a small footprint, this compact unit can be easily positioned into machinery spaces. 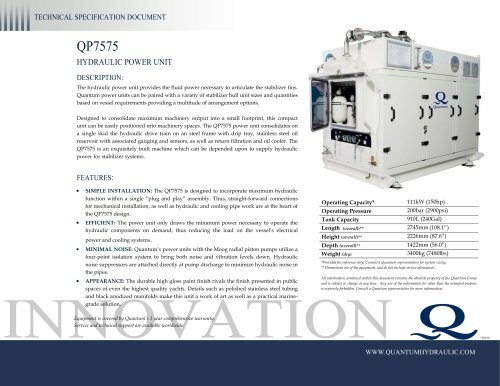 The QP7575 power unit consolidates on a single skid the hydraulic drive train on an steel frame with drip tray, stainless steel oil reservoir with associated gauging and sensors, as well as return filtration and oil cooler. The QP7575 is an exquisitely built machine which can be depended upon to supply hydraulic power for stabilizer systems. FEATURES:  SIMPLE INSTALLATION: The QP7575 is designed to incorporate maximum hydraulic function within a single “plug and play” assembly. Thus, straight-forward connections for mechanical installation, as well as hydraulic and cooling pipe work are at the heart of the QP7575 design.  EFFICIENT: The power unit only draws the minimum power necessary to operate the hydraulic components on demand, thus reducing the load on the vessel’s electrical power and cooling systems.  MINIMAL NOISE: Quantum’s power units with the Moog radial piston pumps utilize a four-point isolation system to bring both noise and vibration levels down. Hydraulic noise suppressors are attached directly at pump discharge to minimize hydraulic noise in the pipes.  APPEARANCE: The durable high gloss paint finish rivals the finish presented in public Operating Capacity* Operating Pressure Tank Capacity Height (overall)** Depth (overall)** Weight (dry) *Provided for reference only. Consult a Quantum representative for system sizing. ** Dimensions are of the equipment, and do not include service allowances. All information contained within this document remains the absolute property of the Quantum Group and is subject to change at any time. Any use of the information for other than the intended purpose is expressly forbidden. Consult a Quantum representative for more information. INNOVATION spaces of even the highest quality yachts. Details such as polished stainless steel tubing and black anodized manifolds make this unit a work of art as well as a practical marinegrade solution. Equipment is covered by Quantum’s 1 year comprehensive warranty. Service and technical support are available worldwide.